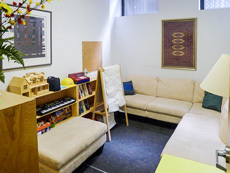 The Harlem Family Institute operates psychoanalytic clinical-treatment sites in affiliated neighborhood schools and community-based centers. This goes to the core of the Institute's mission to take psychoanalytic work out to the community, especially since its founding purposes included providing care in Harlem communities where quality long-term psychotherapy services were often unavailable. From its origins in the Children's Storefront alternative school in 1991, the Institute has sought to help children and their families in school settings. A school can be a trusted presence in the community, offering mental-health services in a setting free of stigma. If seen at school, children don't have to be taken to a clinic by overburdened caretakers; sessions are less likely to be missed and attendance can be more consistent. Unlike typical short-term clinical settings, with the possibility of frequent staff turnover and disrupted attachments, the Institute aims to offer 3-4 years of care to each child by the same therapist. The ease of communication between teachers and therapists makes an in-school program particularly valuable. Families choose to enroll their children at CPE 1 because they value its small, diverse school community, rich arts program and excellent progressive education, which recognizes and fosters a variety of learning styles. CPE’s educational philosophy is rooted in the belief that children must be valued for the experiences, language, and culture they bring to the school. Its mission is to help learning by providing every child with materials, experiences and support services that will enable her or him to experience academic, social, and emotional success. The school's commitment is to an inclusive approach, cross-age groupings, learning-by-doing and the use of an integrated curriculum driven by children's interests and abilities. The school, located on East 106th St., is conceived as a learning community, with all members sharing in a common enterprise, so that children, teachers, staff and families work together with generosity and mutual respect. It encourages engagement with the local community and the wider world. The school aims to provide students with a high-quality, arts-infused, project-based experience that will develop their skills and passions for inquiry and engagement in support of their growth as scholars, workers and citizens. Families from various socioeconomic and cultural circumstances are drawn to the school's rich educational environment. All classes are mixed-grade, encouraging students to stay with teachers for two years, reducing student competition, increasing individuation of learning expectations and allowing for children's social/emotional fluidity. The school, located on West 169th St., follows the progressive educational philosophy in the tradition of Dewey, Weber, Meier and Carini. It pursues balance between the values of the individual and the community, skills and habits, expression and perception, choice and adherence, measurable and immeasurable, and safety and risk. Families are organic partners in the educational process. They are welcomed into the school community through weekly communication, classroom volunteering, workshops, community events and governance committees. Community-based organizations, including nonprofits and houses or worship, can provide excellent settings in which to provide long-term psychoanalytic therapeutic services to people within their communities. While the Institute's core work has been with children and families, it is also able to work with people of all ages and needs. The Franciscan Community Center aims, in the spirit of St. Francis, to serve all, but especially the poor, the alienated and immigrants. The center, at 214 West 97th Street, develops, manages and supports educational, recreational and outreach programs that seek to create positive change in the lives of those it helps. Its youth services, focused on newborns to 21-year-olds, are designed to support academic growth, nurture appreciation of the arts, encourage healthy social interactions, build self-esteem, enhance a sense of community and increase views of the world and the potential of our youth. Parents are encouraged to bring their newborns and pre-school-age children for Babies & Toddlers play and socialization. An after-school program escorts children from local schools to the center, where it offers academic classes and individual tutoring, test prep, supervised recreation and theater-arts experience. A five-week summer camp offers a sports clinic and more. The center’s social services include child-care guidance, cash assistance, senior assistance, help with food stamps, Medicaid, Social Security and legal housing issues, and counseling. Its food pantry and sandwich line serve hundreds of people. To see an analyst in our clinical office at the Franciscan Community Center on West 97th St., call the Institute on: 212-920-7965, and press 1. The Institute’s treatment center at St. Mary’s is currently in abeyance, but the Institute, which has worked here for years, hopes to be able to re-establish it in the future. St. Mary’s is a special center in Harlem with a rich history, offering a variety of services for the homeless, unemployed and low-income residents of the neighborhood around West 126th St.
As Benjamin Jealous, congregation member and former NAACP president, says, "St. Mary’s has maintained a fiercely prophetic and inclusive presence in Harlem, Manhattan, and the Episcopal Church for decades… It is a church that is committed to standing up for the oppressed and unifying Harlem and the world across old and new lines of division." Church and community volunteers staff a food pantry every Monday, serving 50 to 60 family units. And on Saturday afternoons an outreach soup kitchen serves 80 to 90 homeless people, taking bag lunches and soup to those on the streets and in parks. A free dental and medical clinic is offered on Tuesday evenings. To see an analyst in our clinical office at the Franciscan Community Center on West 97th St., call the Institute on 212-920-7965 and press 1. If you operate a school, community-based organization or house of worship in New York City and would like to host a clinical-treatment site for which you can offer us some space and modest funding so we can work with your community, please contact us at Harlem Family. Despite the Institute's name, its charter authorizes it to offer services anywhere in New York City, though its mission is to focus most on underserved neighborhoods where the unmet needs are greatest. The Institute is eager to be of service in all boroughs and wherever there is a need. It is interested in developing relationships with organizations that can provide it with some space and modest funding to support an Institute treatment and training site, allowing us to take psychoanalytic work out to the community.